I apologize for a lack of update for those who may have been waiting for one, I have just been so busy! The first few days after surgery were definitely not easy. Leo was very sleepy for the first few days, and although otherwise pretty good, he absolutely refused to eat or drink for days 2-6 post-amp. He would eat a couple dry treats I offered, but capped himself at 2 a day it seemed. I tried different treats, every smelly wet food I could find, I tried several flavors of baby food, and I even tried a truly disgusting mixture of baby food, tuna water and mashed up tuna chunks, all watered down with chicken broth. You’d think that would be a cat’s dream (less of a dream for his seafood-detesting owner :p ), but Leo was simply not having it. Increasingly concerned he was going to become dangerously dehydrated and/or starve, I resorted to force feeding him using a 10 mL syringe. A member here (Holly, bless!) suggested a meal replacement formula made by Pet Ag called CatSure. My local PetSmart did not carry this particular formula, but I did find a similar one made by GNC there. I also picked up a calorie booster paste made by GNC there as well. I think he was not a fan of the paste (it didn’t seem very palatable…), as he fought that more than the syringe, but I just wanted to get as much food in him as I could (because it wasn’t much). It was not a fun process, but I was at least able to get some nutrition and hydration into my poor boy this way. 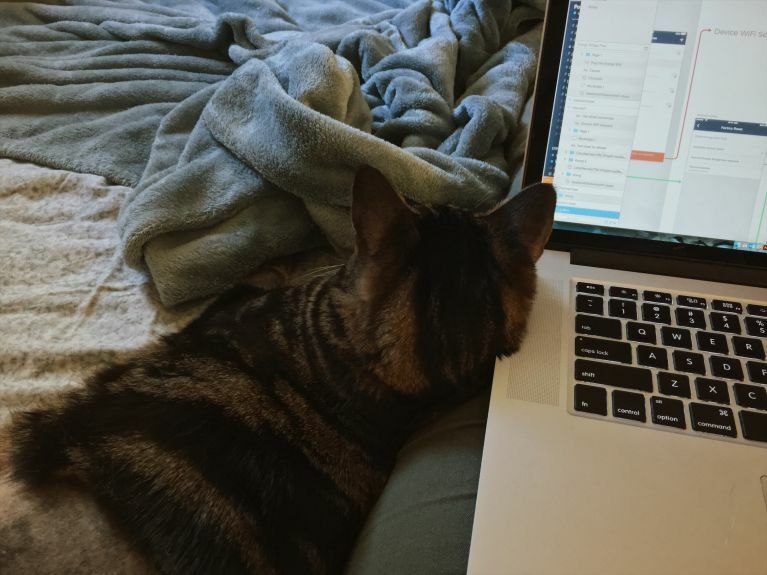 I am lucky to have a job which allows me to work from home if need be, but working remotely is still indeed work, and it was very stressful to try juggling that and force feeding your cat every hour or so. I don’t write this to frighten anyone who may be going through this soon themselves, but just to prepare yourself for the task ahead. If you are able, I highly recommend you take off work for at least a couple days after bringing your amputee home! Yesterday morning (Day 7 post-amp), we at last had a breakthrough when Leo started eating on his own. He has since been doing remarkably better, and is more active and seems more comfortable and his normal self. I was never more relieved than I was to wake up to him munchin’ away, and he kept going back for more a few times throughout the day! Because there are no signs of mets in Leo’s lungs, which in cats is typically the first place they appear outside the initial tumor, I have decided not to go through with chemo for now. We will be going back to ASC in early April for another checkup with Dr. Walshaw and do some more radiographs to check for signs of mets, unless anything changes before then. It’s not an idilc situation, but I am heartened at such a long prognosis even without treatment, as well as Leo’s positive change in mood and behavior the last two days. He is a happy cat with a very strong and light spirit, and I hope I will get those 4 years with him. I will continue to share updates and advice for the post-amp life as they come! Sorry I didn’t get a chance to update yesterday, but there isn’t much to report. Here’s an image of the incision on Day 2, which still looks nice and clean. Leo spent most of the day sleeping yesterday, and I sat in my bed with him working on my computer for most of the time myself. He seems very down and it’s pretty sad for me to watch. I’ve been trying to encourage him all I can to perk up, and later in the evening I coaxed him out of the bedroom to hobble around the living room a bit. He also went to use his normal litterbox as opposed to the shallow one I put in my bedroom, which is covered and a bit trickier to get into in his current wobbly state. The first time, he got so tired he just wanted to lay down in it, but when I took him out, he went right back in again and actually used it and came out on his own. I’m trying to let him do things he wants to, and boost his confidence. Doctor also recommended to encourage him to exercise gently as much as possible. Leo spent most of Day 2 right here while I got some work done. My biggest concern is that he’s still refusing to eat. 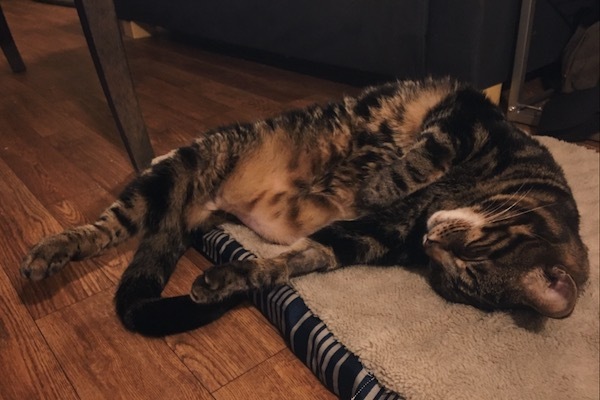 I have tried wet cat food, dry food, some chicken baby food, tuna, and a baby food/tuna mixture, and I tried it both cold and heated up a bit, but nothing is interesting him. I don’t think he drank any water that I could see, either. I wasn’t in the room all day so he may have had a sip when I wasn’t looking, but every time I’ve tried to encourage him to eat or drink myself, he just turns his head away from me and seems annoyed at my advances. I’ve tried on and off today to encourage him to eat and drink, but still not much luck. I was going to resort to force feeding him (which I really want to avoid if at all possible), but he voluntarily ate 2 of the dry treats I offered to him so I’m trying to hold off still. He still doesn’t want to drink, so I managed to squeeze a few dropper-fulls of water with a glass eye-dropper (which I’ve never used before, just came in a pack of 2 I got to clean out my wisdom teeth sockets last summer) about 40 minutes ago. I think the best way to start this blog is with an intro of sorts. 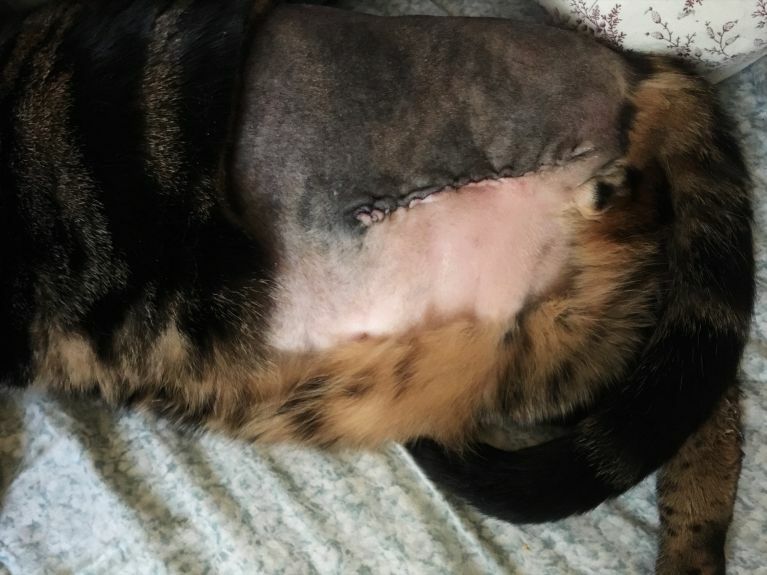 I’ll warn you now that this is a p long read, but when I first started dealing with this, I found very little information about cats’ experience with a hemipelvectomy, and I’d like to share as much of my own as I can! My name is Sara, and I am the proud cat-momma to two goofy li’l fluffs named Leo and Zooey. I’ve had pets for most of my life, but after my first cat, Spot, was tragically struck and killed by a car, it was a good few years before another made its way into my life. For my 18th birthday, my parents’ gift to me was allowing me to at last bring another cat into our home. A lot happened over the following 6 years. I moved to Michigan for college, and my parents were so kind to keep Leo and Zooey for me while I was in school. During that time, much happened, and they eventually got a sister (er, aunt?) kitty named Charlie. When I finished school and moved on dorm life and into my own apartment, Leo and Zooey finally got to move back in with me. Overall, life has been pretty good the last three years since. These cats bring so much joy to our little home, even if they don’t always get along with each other. :p Their personalities are both so distinct, and I love both of them to pieces. Zooey is very dainty and particular about ways, and likes to be right on top of me at any given opportunity—even when it’s not always the most convenient 😉 Leo is more of a big ole blob, with and endless capacity for love and headrubs on anyone who will let him. This year especially seemed off to such an optimistic start, until about three weeks ago, Leo started to limp without any apparent cause. My life has been kind of a messy blur since. Leo is prone to random bouts of leaping wildness, and I thought at first that maybe he’d just pulled a muscle or something. As the week went on, his limp just got worse and worse, so I took him to see our vet. She looked him over, weighed him, did all the usual basic exam stuff, but also could not see an apparent reason for his sudden limp, and so I okay’d an x-ray. I was entirely unprepared when she took me into another room to examine the x-rays. A pet owner never wants to hear the phrase “There’s something here that really worries me,” from their vet, but there I was, looking at a black and white image of my boy’s pelvis and trying to comprehend the ominous dark area around his hip-socket. 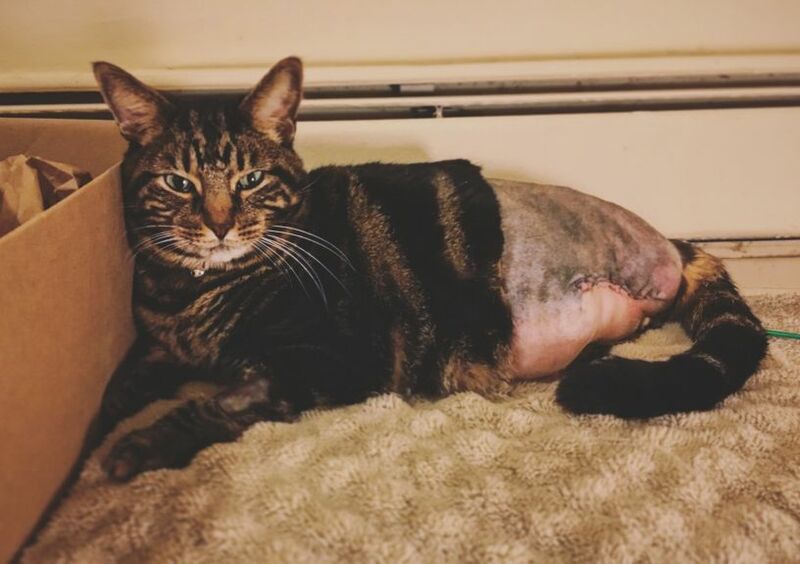 I was devastated, especially as my vet kept repeating how unusual bone tumors in cats are in the first place, let alone in a non-limb bone, and especially not in a cat as young as he. She referred me to a specialist, and luckily was able to squeeze me into an appointment at the Animal Surgical Center of Michigan up in Flint. That’s a long drive for me, but she recommended them so highly that I just had to. I clung to the slight hope that maybe it was not the dreaded “C-word” that was causing my boy such pain, but after that VERY long ride (Leo is absolutely terrified of car trips :c ), and a very short examination of the x-rays, the doctor said it seemed indeed a nasty cancer was eating away the left side pelvic bone and the top of his left femur. If I wanted to take away his pain and give him his best chance at life, our only option was a hemipelvectomy. This is a very drastic (and expensive, oh boy) surgery, and I had such little time to take it all in. I ultimately decided I had to do what I could to try and save the life of this sweet cat of mine. The next week leading up to surgery day was difficult. Leo was clearly in a lot of pain, even while taking strong pain medication (0.15mL of buprenorphine orally every 12 hours) to try and ease him through it. Saturday night (3 days before this post) was particularly brutal, as Leo took a nosedive and began wandering around behaving very strangely as if in a daze, and growling in pain no matter what he did. I tried to wait it out, but when his next dose of bup did not seem to relieve him after an hour, we ended up going to a 24 hour emergency clinic, where I spent the next very long 4 hours. The doctor there could not feel a pulse in his bad leg, and feared he’d either thrown a clot, or the tumor had begun causing an inclusion of blood to the leg. If the latter were the case, it would mean the leg would quickly start dying on his body, and he would not be a good candidate for surgery. He did a glucose test where he compared blood samples from his neck and each of his rear legs. If the glucose levels in the bad leg were lower than the other two samples, it meant the leg was dying—very, very bad. THANKFULLY though, all three samples came out a perfect match and I could breathe a tiny bit easier. They took some more x-rays, which revealed that Leo’s hip socket had been entirely eroded away so that his femur bone was rubbing directly against his pelvis bone, which was likely causing him an exorbitant amount of pain. It was truly heartbreaking, but there was also the silver lining that there seemed no evidence of other soft tissue masses in his legs. +1 for being cancer free post-amp! We left the 24 hour clinic with an upped dose of bup, this time 0.2mL every 8 hours to get him through to surgery day. It was tough watching him hobble along, but we made it. We made another long drive up to Flint early yesterday morning for surgery day. It was a long day of waiting, but around 5 pm Dr. Walshaw called me to say he’d just completed the surgery, which went very well and that I could pick him up the next day! We have our follow-up appointment next week, where Dr. Walshaw will review the biopsy results and give us his full prognosis. In the mean time, it’s time for a good rest for both of us (perhaps me more so than him at this point—I am le pooped). Leo was given 0.25mL of buprenorphine at 3mg/mL concentration at the hospital today for pain relief, which they said should be good for 3 days but I can give other pain meds as needed for breakthrough pain. He was also given an injection of 0.6mL Convenia (Cefovecin sodium) at a concentration of 80mg/mL. This is an antibiotic that lasts for 14 days, and may cause some digestion side effects (vomiting, diarrhea, loss of appetite). He has not eaten today, and I still haven’t been able to convince him to, which has me a little concerned. The only medication I was prescribed to give him myself is (1) 6mg tablet of Onsior (Robenacoxib) every 24 hours for the next three days, first being today. However, it needs to be given with food, and I’ve tried all the tasty things I have on hand to try and encourage him, but to no avail. He just seems to want to sleep, this poor guy. :c He did use the litter box a couple times (even #2!) at the hospital today though, which is very good. I read that sometimes rubbing honey on their gums will stimulate a cat’s appetite, so I will try that in a bit. If not, I hope it will be okay going without the anti-inflammatory until morning..
Leo's Life on 3 Legs is brought to you by Tripawds.